Portobello mushrooms are actually brown crimini mushrooms that have grown to at least 4 to 6 inches in diameter. Add these meaty, brown fungi to casseroles, pasta dishes and stir fries, or enjoy them by themselves after grilling, roasting or sautéing them. Buy Portobello mushrooms that feel firm and appear plump — not shriveled. After cleaning them, use a sharp knife to slice them according to your preference. Rinse the mushrooms under cool running water to remove the dirt. Dry them gently with a paper towel. Slice the Portobello mushroom stems with a knife. If you wish to eat the stems, cut off the end of the stem only. Otherwise, slice off the stems near the caps and discard them. Scrape the gills from the underside of the mushroom caps with a spoon. Discard them. (Removing the gills is optional; do so if you plan to stuff the mushroom caps with other ingredients or if you plan to cook the mushrooms in another dish, rather than preparing them separately.) Portobello mushrooms with the gills intact will dye a dish a dark grayish color. Set each Portobello mushroom cap upright, then slice it in half. Cut across each half to make mushroom slices thin or thick slices, according to your preference. If you plan to sauté the mushrooms, you might cut the slices into quarters or halves. If you plan to top a sandwich with this ingredient, slice the mushrooms into thick slices. Chop the Portobello mushroom slices into smaller pieces if you wish to add them to other dishes, such as scrambled eggs, pasta sauces or soups. 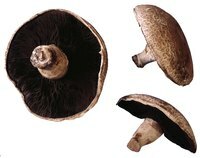 Ochef: Is It Cruel to Remove the Gills of Portobello Mushrooms?